...to say "I love you"
...to be someone worth loving for. That is how I say goodbye. Unfortunately, you're not part of it. But sad to say, it's not you. Yet that man of my dreams isn't you. That is how I lie. For 36 months, I waited. My wells of emotions just dried up. I had enough of the expectations and all. I had fair shares of failure and heart aches. No more breakdowns, no more heart rush, no more obsession, no more of your candid image. You have plans and I can sense it. I have made up my mind. No "us"! In the first place, there is no "us". It has been discussed in my Education 4 subject that for a person to be a professional teacher, he must not only have to possess moral values and integrity to himself and that inner passion for the job but also must finish a bachelor's degree, have a continuing education, take and pass the Teacher's Board Examination, and comply the requirements of the board. Indeed, for a teacher like her, who did not only have a master's degree but also had a doctoral degree and became a principal in two elementary schools and a high school, who would not say that she is a professional and a teacher by heart. However, the issue is not about her. It's about her topic on Teacher as a Professional and another major professor who scolded us because we were alleged to not know how to spell when in fact the defect is in her. Who would not ask for the spelling clarification of a word that cannot even jive with the rest of the words in a sentence to form a complete thought? And the featured word was "pass". The phrase was "to connect in the pass environment". It sounds awkward, right? She repeated the sentence and I inspected the way she pronounced it. "Pass" indeed. Then she wrote the word on the white board after she heard incessant commotions from the rest of the class. "Past". Another series of "ahhhs" and "ayyys". Suddenly, she pointed at us and began to scream, "You are going to be future teachers and until now you don't know how to spell simple words?" Wow! She's outrageous. She was blushing in anger. But the fault is all hers. In the first place, she doesn't know the correct pronunciation of the word. In fact, it is only one of the many words that she murdered when she begins to speak in front of us. Since she has been doing it every time we meet, our audition has got used to it. Unfortunately, she has been considered as one of the important people in NORSU and I say she teaches in mediocrity -- nothing interesting with her soft voice and redundant lessons at all. She is the head of the practice teaching department and what she can attain is that kind of pronunciation in front of her class. Words with [e] vowels become [i] when pronounced and vice versa. [P] becomes [f] and vice versa, [b] becomes [v] and vice versa, and the rest of the words are just spoken weirdly that we cannot even understand sometimes what she's completely talking about. Sad to say, she is a Doctor of Education and the only thing she can do to cover her constant mistake is to blame the students for it. When I saw their faces, I realized how I looked closely like them before -- lost, blank, and walei. Now that they have finished the first part of their examination, they have to endure the five interviews. I am looking forward to the upcoming members of The NORSUnian. I mean it when I say I hate acquaintance parties. I hate how everyone try their best to be the most gorgeous person for the night when in fact there are lots of them who share the spotlight. I hate how people require us to wear something that isn't our fashion statement. I hate how they look at others and begin laughing at them when they see something that is not pleasing to their eyes. I hate the whole thing and I am sorry for that. Perhaps, that is why he called me KJ. That stands for kill joy. I exited out of the venue right before they could start the second part of the program, that's right after I have finished my dinner with two of my other KJ friends, hopeful that I can catch the last ride home. But I did not...and I am thankful for being stuck in the TN office which made me enjoy the benefit of Facebook and Blogspot. These have been like extra rice and chicken laid on my plate. Still, I am KJ and I admit that. Is that a bad thing? However, KJ did not only stand for Kill Joy. It also meant KILIG JUD. This year's acquaintance was not as bad as I thought. Maybe those three red roses did the magic. Before I could finish the salad that I was religiously concentrating on, guys from a nearby table began standing and approached some girls in the neighboring tables (with matching romantic background music). I was blank when a bouquet was handed to me. I tried to ask the guy in front of me if it is an advance gift for the Valentines Day but I know he did not hear me when I asked that. He was too shy to stay longer and I have seen that in his eyes. Anyhow, I am still thankful for that person who remembered to share something to me. I will never forget him...for he is the first man, in my entire life, to give three roses (louya nako...ing.ana ka mingaw akong lovelife). Thank you so much. ...for they will be called the sons of GOD. I wonder how many people have backbited me. I wonder how many of them have the intention to do so or how many of them did it only for fun. I wonder who among my friends can really be called such. I do not know. I don't have a single idea who is who. But one thing is for sure. I gave them the real me and I have told them the real feelings that I have for them. I tried to give them the Rolyn that they wanted but still it wasn't enough. I tried to be as friendly as possible so as not to be called snobbish and hostile but they cannot get what I was trying to do. Life, I guess, is just like that and I have to deal with it. Then again, there are some people who cannot show a single manner of concern for another person. People who cannot give a damn about the feelings of others. People who do not know what discretion is. People who doesn't care if somebody has been hurt or not as long as they have said what they have to say. People who are apathetic, sadistic, and worth stabbing for. But I will not retaliate as much as I want to. As what the Bible said, blessed are the peacemakers for they shall see God. All I need to do now is forgive, give them as many second chances as I can and shut my mouth so as not to hurt anyone beyond my control. It would be one of the nights that I will never forget. Tuesday nights aren't just too comfortable for me since I have to attend the weekly meeting in TN and at the same time study the lessons for the next day. Tatay and I would trek the vastness of the road and the silent night becomes our companion. Accidents are always lurking around and every time the brakes screech into the asphalted road, I know something's wrong. We killed a white cat who came out of the bulrushes and rushed to the highway. We were almost hit by a van with a driver who did not even bother look at his rear mirror. We were very wet when a heavy downpour of rain caught us. We were almost blinded by the irritating high lights of the motorists. We almost lost balance when an overtaking motorcycle hit us. And recently, the back tire of the vehicle gave up. No one to help us in the middle of the night, no one whom we can ask for help. No one but me and Tatay on that lonely thoroughfare. As I tried to calculate the remaining distance before we can reach home, I was disturbed. We still have to travel more than seven kilometers before we can finally say we're safe. I believe Tatay was hesitant to continue with the drive but he did. "Ging, hinay hinay na lang gyud ta ani. Wa natay mahimu. Maulanan pa unya ta." I heaved a deep sigh and asked him in a whisper, "Ok ra ba? Mubuto n'ya ang interior ana." I tried to be as concerned as possible when in fact I am more worried about the present plight of my father. If only I asked to leave the meeting earlier, this would've not happened. I was in deep resentment that I still have to include Tatay in whatever vain fave I am in. It wasn't vain actually. It was just of less importance. Sigh! And yes! Indeed, we were running flat. I pity the motorcycle and I pity Tatay. I hate myself. I hate myself for being inconsiderate. I hate myself for putting Tatay into this kind of predicament. But then, he started to whistle a familiar song and the once silent road with two commoners in distress became a jovial one. The stars are back in the sky yet the cold breeze of the Tuesday winds did not cease to blow. Though the trip back home was set in a slow and bumpy motion, I thanked God we arrived home safe. I thanked God for giving me a Tatay who, despite the predicament, still managed to hum a song. And I thanked Nanay who stayed awake until 11:30 p.m. just to wait for the arrival of her beloved husband and daughter. So for me to avoid more of the curse of ugliness, I have to smile everyday not only because it is a necessity to have a healthier life but also because I know I can squeeze delights out of everyday situations or circumstances. Life is as precious and as beautiful as that. People might sometimes undervalue the essence of laughter with their friends and family but the knot that has been tied stronger between those relationships is immeasurable. Laughter can be pixie dusts that can turn blue days into magical moments. Laughter can be the instrument for two hearts to be intertwined. 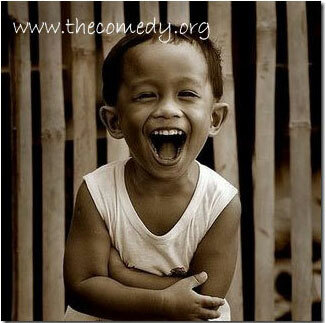 Laughter can be the most valued remembrance a friend can give to his best pal. "A ROFLOL a day keeps the doctor away." Give your best laugh today and give a better one tomorrow. I had a rather empty stomach feel than an energized body. This product seems fake and unsatisfying. The oats did not feel like real oats in my palate and the choco drink did not even have a punch. Everyday, I go to school with only three or four spoons of rice and a half slice of either a fish or a piece of hot dog or a portion of a sunny-side-up egg or a bit of pork. With a body that I have, eating this much doesn't give me a sense of energy and alertness. Tatay then tried to buy something which can at least fill my stomach when I my biological clock begins to knock. 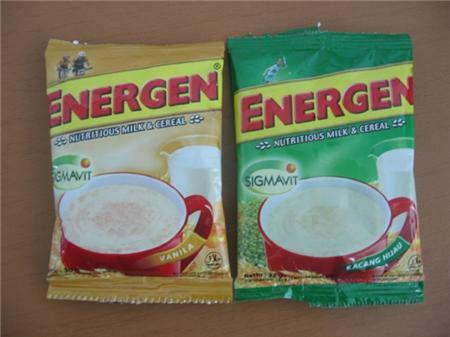 But when I indeed opened a sachet of Energen and poured it in a cup of hot water, the stench of a cocoa something welcomed my nasal tracts. I assumed it's part of the uniqueness of the product so I took it for granted. It doesn't smell irritating or distasteful anyway so I continued my sip. As my tongue began to feel the "oats", it melted like a piece of bread crumb. The pulpy-like, bland-like, 'oaty' feeling wasn't there. Too bad. I wasn't satisfied but at least my tummy was filled with something less junk for a drink. I want to curse but because I am not a scornful person, I will then keep this as one of my hatest thing in the world without being outrageous. What I am fearing from the beginning of my entrance to this university until the present has finally come. I hate dancing and those people close to me know how awful I am when it comes to dancing. I am a very mobile person but I just don't know how awkward I look like when I start doing moves that interpret dancing. Now that it is the main lesson in our Physical Education class, I have hated the subject all the more. The teachers are alright and my partner for the first presentation seems kind and domestic with his glasses on but the fact that we will be dancing in front of bystanders and passers-by in the open court, it would be a great shame in my part (imagine a walking stick dancing jazz and samba..goodness gracious). Good thing I have this close friend of mine who considers dancing as her forte so I believe I have to humbly ask her to teach me. Although I want to quit in my Physical Education class (if only I can without affecting my grade, I would really do it) I also have to prove to myself and to the whole world that I have survived P.E. 121 just like them. Aja to me! Beware! The things that you will read in the next few paragraphs might bore you to death and I am asking for an advance apology. Blank. My hands and my mind are working harmoniously and actively at this moment to create a post in this blog but it seems that at this time also have I not experienced something that's worth blogging for. My memory box is empty and I don't have the stimuli to make a fiction story. I also had enough of the Matt Evans thingy so I really can't have a productive post today. Sorry! Spilling the beans. The guards are on the loose again. I just spotted the tall, dark, and paranormal scarface recently this afternoon roaming around the campus in a seemingly authoritative disposition. I believe many students hate, dread, or even fear him but as for me, I don't have anything to worry about when I meet him in foyers or alleys. He's nothing but a security guard, tasked and paid to protect the welfare of the university. He's not here to threaten or to physically hurt the students. Oh come on! I know there are so many students in the university that's more intelligent than him and therefore he has to be aware of that. He would be in great shame if he will come to a point of messing up with the wrong students. Watch out! I understand that it is part of his job to inspect the identification cards of the students and the faculty but I hope he won't go beyond that. He must not overuse his power in implementing acts that's not even favorable to the studentry. For goodness sake! Is he even aware that he has been back stabbed every now and then by tactless studs? He has to. He really has to for there are lots of 'em whose burning desire to dispatch him intensifies from time to time. Goolak! Tired. And therefore, I am tired. I am tired of your absence. I am tired of your presence. I am tired of your smiles. I am tired seeing your eyes. I am tired of expecting. I am tired of waiting. I am tired of this walei feeling that's not supposed to be here. You're so lucky I am obsessed with you. Now, I am having a hard time eliminating it. I am tired. I am tired of you. Giatay! I never expected it to be like this. Uber nah. urghhh! Go home, katulog sa imung banga ug ayaw na pakita nako. I am tired, DARN YOU. July 12, 2010. It was terribly a dreadful day for you. Though you saw Matt Evans' smile again and had fun singing the so-fa syllables of Lupang Hinirang in the Humanities class, your day was still clouded with embarrassment and remorse. Disrespectful. You were trying to get out of the jeepney as fast as you can but the moment you were about to near the exit, an old man, not even classified an authentic Filipino, began to push you on the side and uttered a stern remark. "You better respect the elder." Then he got out. You tried to tell yourself that it was his fault. He was just a foreigner -- an old, senile, incompetent man who came to the Philippines to seek for someone to take care of him and he has no right to be rude in a place where he doesn't even belong. But he also sounded right when he said that you have to give way to the elder. All you have now is the wish that he did not push you that hard. Late Comer. That morning, you thought the jeepney where you have rode will bring you to school in time. However, the whole thing came into a halt and began to run in turtle-pace. At one minute, you thought you would die because of the speed but the next minute, you thought of pushing the jeep just to make it faster. The result? Late in the first period class in the morning. Talkative. You almost melted when the teacher got your attention. Who would not be disturbed by a girl whose body is in the classroom but the ears and the eyes are on a friend outside. Palibhasa, inuna pa 'yong kaibigan sa labas kesa sa lesson ni ma'am. Ayan tuloy, napahiya. Butol, Bobo, Brain blast!. You hate Math and you never attempted to make ways to love it. Your teacher was as boring as could be and your eyes began to close. You wanted to sleep but you have reservations. Good job! Clumsy. Of all the things that you hate, why this? In every way, you are so prone to accidents that even your friends laugh at your clumsiness. After tripping in that rail and being laughed at by Criminology studes, you realized how important it is to look at where you're going. Mad. You wanted to rest and get out of all the misfortunes for the day but the moment you sat in front of the monitor to edit an article, your seatmate began to taunt you. You got angry of course and a topic which was supposed to be opened was officially closed. In a weather where umbrella and rain coats are necessities, people begin doing things that seem embarrassing at times but for the sake of keeping themselves descent and presentable even in the heavy downpour of rain, they do not think of it as too much or embarrassing at all. Thursday. It's my time to attend my major subject with my usual TTh attire -- a pencil, ash blue blouse, stockings and high-heeled shoes with a shoulder bag and a shoe bag. Before I left home, I have already thought that it would rain but still, I made an optimistic remark that it wouldn't. My apprehension was a total ruin when a heavy downpour tapped the roof of the jeepney that I was on, a few kilometers away from home already. What a start for a good Thursday! Anyways, when I arrived at the terminal, it did not cease yet continued to bring havoc to my pretty attire. I began to murmur unnecessary complaints. Good thing there was still this old man grappling an umbrella in his hand as well as calling passengers to the nearby tricycles. I was hesitant at first to show gestures that I needed shade but when I realized I am almost late for an exam, I peeped at the entrance of the jeepney and lucky me for he has seen my radiance. (Tweng!) Although my stockings and my shoes began to be filled with water, my head and my whole image wasn't so ruined yet. Unfortunately, it was never in the rain's plan to stop so I have to go down of the tricycle and catch a portion of wetness and adventure under the heavenly liquid. I befriended another student who was dearly kind to me since she offered her umbrella up to the area where my classroom is located. Wow! I was so grateful for that act of kindness. Thank you, I said. I am hoping to see her again soon. I might have been all soaked up because of that surprising outpouring of heaven's wrath yet at least, I have found a one-time friend who suffered with me under the rain. I am beginning to love guitar now. That includes music, of course. That was what I realized when I observed my classmate in P.E. play the stringed instrument with grace and beauty. I love looking at her especially the way she quickly transposes her fingers from one note to another. What a beauty indeed! I would really aspire for the knowledge of musical instruments and since guitar is the most available instrument I have at home, except for piano and flute that I find quiet difficult, I have to make use of my extra time strumming the four-stringed chords of the guitar. Book fair. That was nearing perfection. The ambiance of the place plus the scent of the yellowish pages of the books. The rows of hard and soft bound copies of novels and documentaries. The clickety-clack sound of the machine as an automatic queue form with bills and coins clasped in their hands. The serious faces of the rest of the book lovers hooked to the breathtaking plots printed at each last page. Who could ever forget that lovely sight? The Proposal. How many of you have seen this movie? As for me, the first moment I watched this movie starred by Sandra Bullock and Ryan Reynolds was way back last night. I was supposed to study my lessons for Ed 3 but since I obviously prioritized the movie confident that the exam would still be on the next day, I am now feeling inactive, physically and mentally. The movie was super nice with all the hilarity of the casts as well as the heart warming love story between the two main characters. It was about a deal made by Margaret (editor in chief of a famed New York company)and Andrew (her assistant)to be married for the sake of saving Marg's hanging chance of being deported of the country. The deal was agreed and both went to Alaska, Andrew's place, for the weekend. There will be discoveries about the real Andrew Paxton and their secrets will not be secrets anymore. You'll absolutely have bunches of laughs when you see the movie. As in! hehehe..
How inclined are you to music? How important is music to you? Do you love to take music classes, read notes, sing in front of forty or more students ? In my case, I have to grasp the fact that I am taking a music class in the name of Humanities 111. It is not easy to read notes, I tell you. It is not easy to memorize the so-fa syllables especially when the scale has a flat or a sharp in it. It is more difficult to imagine that I am one of the assigned students to teach the rest of our classmates regarding the reading of notes in a scale, without writing the names of the notes on the song paper. I don't have enough of the capacity to read notes and identify them that swiftly since it is never my expertise. You can let me write a novel without murmuring than to teach two students at the same time about how to recite and know notes properly. I think I have to equip myself more of the music terms and I have to ask my mother, who is wonderfully a piano player and teacher, to teach me more about the strategies on how to read notes without confusion and with ease. May God bless me in this challenge. August is fast approaching and until now, the publication is still looking for writers, photographers, and cartoonists -- with high regards to the writers, for that matter. The office has been relinquished by one of the bests and that included our recent editor in chief who played a great part indeed in the realization of my dream. There were also computer wizards who graduated and got another life outside college. 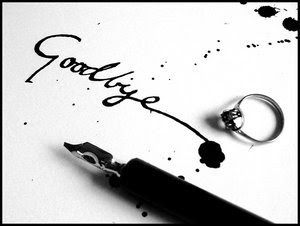 There were editors who have to bid farewell to their alma matter and at the same time to their respective offices in the publication since they are now graduates. They don't want to leave, I suppose, but I know that they don't also want to overstay in the university. May God bless them. Anyway, with the continuous decline of the number of staffers and writers, The NORSUnian has finally decided to cross the borders. We did not only limit ourselves in advertisements through posters and Facebook tags but we also erected a site for public awareness that was suggested by one of the members of the staff and fortunately, heeded. The idea seemed to work since there were lots of the students who said that they have been looking for the publication but was not able to see it. The number of applicants has also increased. Congratulations! Every applicant deserves a slot in the publication but sad to say, only ten writers are to be hired together with one artist and a photographer. Aja to them all. LOLZ!